Jump leads are an invaluable piece of car kit, especially in winter when your battery is more likely to become flat. You may have accidentally left the radio or car lights on overnight but never fear, it’s easy to fix with a good quality set of jump leads and a car with full battery charge. Check the flat battery for signs of cracks or leaks. If you try to start a car with a damaged battery there is a risk of fire or explosion. Locate that batteries under the bonnet of each car and park the donor car opposite with a walking space in between. Now you can revive your battery should it become flat or rescue another driver in a similar situation. However, if you have any doubts or questions about jump leads or your car battery, we’d happily have a chat to you at MEB the Motor Centre, in Edmonton. 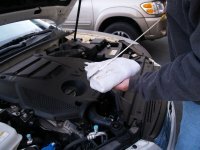 This entry was posted in Uncategorized and tagged Enfield garage, garage Enfield, garage in Enfield, garage north london, garages in north london, how to use jump leads safely, jump leads, MEB, MEB motors, north london garage, starting cars with jump leads. Bookmark the permalink. Both comments and trackbacks are currently closed.